No new posts here until Monday. I’ve been called to serve on a trial jury, where I will do my best to provide our justice system with a Sanity Injection! A vote in Congress for Washington D.C.? If you have ever seen a license plate on a car from Washington, D.C., you know the motto it bears: “Taxation Without Representation”. The license plates were changed several years ago to bear that famous phrase as a political shot across the bow to Congress to resolve the District’s unusual situation. Simply summarized, all American residents live either in states or territories. If you live in a state, you pay federal taxes and you are represented in Congress by a Congressman and two Senators. Your state casts electoral votes that help determine the outcome of a Presidential election. If you live in a territory such as Guam, Puerto Rico, or the US Virgin Islands, you do not have to pay federal taxes, and you are not represented in Congress. You may vote in a Presidential primary, but your territory gets zero electoral votes in the general presidential election. However, the federal District of Columbia differs from both. The Constitution gives Congress full authority of the District’s affairs, although for local government, the city of Washington has an elected Mayor like any other city. Under laws passed by Congress, DC residents do pay federal income taxes and do get 3 electoral votes in the Presidential election. DC has no Senators, but does have a delegate to Congress, currently Eleanor Holmes Norton. Ms. Norton may speak during debate and may cast votes on the committees she serves on, but does not have a vote on the floor of the House. Hence, DC residents can accurately claim that they are taxed by the federal government without being represented in it. There have been various suggestions to resolve this situation. One solution would be to make DC its own state like any other state. Another solution would be to “retrocede” all the residential areas of DC back to the State of Maryland. For political reasons, Democrats tend to favor the first solution and Republicans the second. A third possibility is now coming before the Senate for debate. The proposed bill would convert DC’s Congressional “delegate” into a full voting member of Congress, while also adding an extra seat in Congress for Utah (preserving the existing Republican-Democrat ratio.) So the House would have 437 members instead of 435. This would also raise the number of electoral votes from 538 to 539, eliminating any possibility of a tie. The problem with this solution is that it may be unconstitutional. The Constitution says that Congressmen shall be elected by the people of the states, not territories. If DC gets to elect a Congressman, other US territories may demand the same privilege. Others fear that having achieved a Congressman, DC will next demand two Senators as well. One other possibility would be to exempt DC residents from federal taxes. But this would be a political nightmare because most Congressmen and Senators maintain a residence in DC and would not want to be accused of trying to exempt themselves from the taxes they vote to impose. House Democrats: Are they mentally ill? The bizarre behavior of Democrats in the House of Representative leaves me scratching my head in disbelief. Only days after Our Leader President Obama spoke boldly of cutting the deficit over the next several years, the Democrat House leadership has unveiled a $410 billion continuing budget resolution to fund government programs for the remainder of fiscal year 2009. What is incomprehensible about this is not the fact of the bill itself – passing a continuing budget resolution is an entirely responsible thing to do – but its size and composition. The $410 billion figure represents an increase of 8% over the level of federal spending in fiscal 2008. Now ask yourself: What other personal, household, corporate, or governmental budget is increasing by 8 percent this year in the middle of a recession?? Insanity! On top of that, the bill is loaded with the kind of earmarks President Obama has promised to abjure. And because of the large Democratic majority in the House, it will be up to the Senate to try to put the brakes on this runaway spending train. It is known to psychiatrists that certain mental illnesses can cause reckless behavior in those who suffer from them. Such behavior often includes profligate, impulsive spending and an inability to consider the consequences of one’s actions. With this in mind, I cannot help but suggest that House Democrats should schedule themselves for a thorough psychiatric evaluation. Should Michael Vick be allowed to return to the NFL? Now that the NFL offseason has begun, speculation has commenced regarding the future of former NFL quarterback Michael Vick. Even those who are not avid football fans may recall Vick’s staggering fall from star quarterback of the Atlanta Falcons to incarceration at Leavenworth federal prison after conviction on felony dogfighting charges. Vick’s prison sentence will be ending this summer, raising the question of whether he could be reinstated after his release to play football in the 2009 season. Vick was suspended indefinitely without pay after pleading guilty to the charges. In order for him to return, the NFL’s commissioner, Roger Goodell would have to lift that suspension, and then a team would have to acquire the rights to Vick through a trade with the Falcons, with whom he remains under contract, but who have clearly stated will not play him again. I’ve seen a few columns on this question, of which this one is probably the most thorough. Essentially, there are three different factors to consider, which I would label as the football factor, the public relations/marketing factor, and the moral/ethical factor. First, the football factor. Can Vick play well enough to be an asset to an NFL team? I think there is broad agreement that the answer to this question is yes. Before his abrupt departure from the sport, Vick was known as one of the finer pure athletes in the NFL. That athletic ability is unlikely to be too diminished once he is able to resume a proper training regimen. Vick’s quarterback skills have been questioned, but depending on his price Vick could make a scary backup for a number of teams even if no one wanted to give him a starting job. However, there is no lack of other quarterback prospects out there, with promising youths coming out of the college ranks on a regular basis. What is questionable is whether Vick’s football talents exceed the others by enough to outweigh the non-football factors that come with him. Such as the public relations factor. Vick’s crime was one that is particularly repugnant to many. Animal welfare groups such as the Humane Society and PETA have suggested they might protest any team that signed Vick. And more mainstream folk might feel a reluctance to cheer for Vick or (just as importantly) buy Vick jerseys or shoes. With more NFL players getting arrested for various reasons, the league and its teams have an interest in presenting themselves as organizations which pride themselves on the character of their players, coaches, and staff. Vick would be an obvious embarrassment in that regard. However, there have been several players convicted of misdemeanors who returned to the NFL. Vick’s crime is also more complicated because it involved gambling on the dogfights, and the NFL has in the past taken a hard line against players found to have participated in illegal gambling. Finally, there is the moral/ethical factor. Does Vick deserve a second chance? Some columnists have pointed out correctly that Vick will have served his sentence and paid for his crime. Why, they ask, should he be punished further by denying him the right to earn his living? After all, Vick left college before earning his degree; football has been his only career. I would argue that playing football in the NFL is a privilege, and not a right. Even the lowest-paid NFL players make six-figure salaries, while many college players fail to make the cut and never receive the opportunities Vick has had. When a convicted felon is released from prison, he cannot necessarily expect to resume the career he had before his conviction, and may have to learn a new career. Vick should be no exception. If that means peddling cell phones at the mall, as a Denver running back did last year before being re-signed by his team, so be it. If I were an NFL general manager, I think I would have a hard time justifying the decision to employ Michael Vick over another quarterback with no off-field issues. But the question remains whether commissioner Goodell should reinstate Vick and allow the teams to make that decision for themselves. With other players, Goodell has generally been willing to grant second chances provided the player is sincere about reforming himself, as I have no doubt Vick would be. But as a lawyer and someone deeply aware of the league’s financial and image concerns, Goodell may not be so inclined to be charitable. I think Goodell will probably agree to talk with Vick, but would be completely justified in refusing to reinstate him. Drawing that line could have a positive effect as a sharp warning to other players who have had run-ins with the law that they risk losing the opportunity of a lifetime if they keep it up. The Bush Administration ignored this order on plausible constitutional and practical grounds. The Supreme Court’s role is to determine whether a law is constitutional; it has no power to order an executive branch agency such as EPA to do anything. Further, the Bush Administration knew that a finding either way would agitate a lot of people on one side or the other of the climate change debate, and preferred to avoid this. Under the new management of the Obama Administration, however, the EPA has signaled its intent to comply with the Court order in the next few months, which it certainly can choose to do. The Clean Air Act is one of the more complex pieces of federal legislation ever written, so there is considerable room for interpretation. However, given the leanings of the Administration, it is expected that the EPA will decide that carbon dioxide is in fact a dangerous pollutant properly subject to regulation under the Clean Air Act. This would give the Administration regulatory power to enforce carbon emission reductions without the need for (or in addition to) action by Congress, which could certainly help them further their goals regarding climate change. Even some who favor an aggressive approach to climate change said they were wary of the agency’s asserting exclusive authority over carbon emissions. They say that the Clean Air Act, now more than 40 years old, was not designed to regulate ubiquitous substances like carbon dioxide. Of course, EPA claims that they could write the regulations so as not to be draconian. What disturbs me is that there seems to be more concern about whether a ruling would be practical or useful in combatting global warming than in the more fundamental question of whether it would be scientifically correct or in conformance with the enabling legislation. If the rationale for labeling CO2 a dangerous pollutant relies on the theory of global warming, then I would argue that the science is insufficient, and should not be whitewashed out of a political desire to do an end-run around Congress. I have long held that the ideas that the ends always justify the means, and that the law is a convenience to be set aside when it suits the purposes of those with noble motives, are inherently destructive to our democracy. The Left cited this view in its justifiable criticism of the Bush Administration in areas such as waterboarding and “signing statements”. To reverse course now and embrace these arguments simply because it now benefits the Left politically to do so would be the essence of hypocrisy. This is in line with comments I’ve seen previously from moderate Muslims who argue that the main meaning of “jihad” is the spiritual struggle to live according to the will of Allah rather than a physical one against infidels. Therefore, I’ve decided that Sanity Injection will henceforth refer to Islamic terrorists as fasadis rather than jihadis. Not to be politically correct, or to avoid offending Muslims, but because I suspect that al-Qaeda types would consider it a gross insult. It’s fitting to slap these monsters in the face with a term from the book they claim to revere. And “the killing of innocents” is about as good a definition of terrorism as anything. So fasadis it shall be. You learn something new every day. I’m not convinced that this belongs in the stimulus plan (I’m skeptical of how “shovel-ready” high-speed rail projects are right now) and I’m also not necessarily convinced that the LA-Vegas run being funded by it is the nation’s most pressing transportation corridor. However, I think more generally the Obama Administration is correct to see in high-speed rail a solution to multiple problems – congestion, pollution, and transportation costs. Railroads were our nation’s most important means of transportation for almost a century before they were largely abandoned with the creation of the interstate highway system by Dwight Eisenhower beginning in the late 1950s. The economic factors that once made it cheaper to ship goods by air and road instead of rail have changed drastically over the last thirty years. Think about this: According to railroad company CSX, even on the existing, low-tech railroad that runs from Baltimore to Boston, a train can move one ton of freight that entire 423-mile distance on one gallon of fuel! Thus, I think it’s important to look at high-speed rail for freight as well as passenger service. Unfortunately, there isn’t a lot of extra money floating around to be invested in this area. But I would support shifting some federal money from other, perhaps less promising areas toward high-speed rail development. Just one request, President Obama: Don’t let Michael Dukakis (with his history of running Amtrak into the ground) anywhere near this, please. You’ve resurrected enough dead Democrats to last for the next 8 years. In Washington, D.C., news-radio adverts are touting the incredible prowess of the Air Force’s new F-22 Raptor. So are these ads supposed to make you want to rush out and purchase a supersonic fighter plane? “Hey kids, let’s head over to Lockheed Martin and buy an F-22!” What’s happening is that as the new president draws up his first defense budget proposal, Obama is under tremendous pressure to prove he is a tough guy via a defense spending increase — which seems the last thing the country needs with the defense budget already historically high and debt being a greater danger to the republic than any foreign government. The F-22 looks great, performs great — and was designed for conditions that no longer exist. 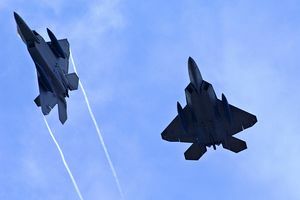 Air Force top brass desperately want to buy more F-22 fighter planes; Defense Secretary Robert Gates, a George W. Bush appointee who is staying on in the Obama administration, wants to end F-22 production. The Raptor is the best fighter any nation has ever built, but it was designed for a mission that no longer exists — Cold War air superiority against top Soviet interceptors. Someday, an unexpected need for the Raptor might happen, considering that actual use of military hardware often differs from planned use. But although the aircraft has been operational for three years, the Raptor has never been deployed in Iraq or Afghanistan, suggesting F-22s lack utility in the low-intensity conflicts expected to characterize future warfare. At any rate, the Air Force already has 180 F-22s. That seems plenty, considering no other nation is even attempting to build a fighter matching the Raptor’s characteristics. Gates wants to stop production because the F-22 is very expensive and, as a nearly 20-year-old design, is in some ways already obsolete compared with the upcoming F-35 fighter, which costs less. But Air Force flyboy types love the F-22 because it looks seriously zoomy and is the sole fighter ever built that can sustain supersonic speed for long periods. Members of Congress from districts where the plane’s components are built love the very fact that the airplane is so costly, about $150 million per additional copy — if only it cost a lot more! Last June, Gates fired the Air Force chief of staff and Air Force secretary, an unprecedented disciplinary act for a Republican defense secretary, because Air Force top brass acted more interested in obtaining F-22s for service prestige than in supplying drones to assist U.S. forces fighting in Iraq and Afghanistan. But Air Force leadership is not excited by drones. If anything, Air Force leadership is worried that drone aircraft will soon put flyboys out of business. (Look up the X-47 in Wikipedia; not only is it pilot-less but it’s a Navy idea.) The blue-suit F-22 faction is staging a whispering campaign on Capitol Hill that Obama will be seen as weak unless he buys more superexpensive Cold War fighters. George W. Bush wasted huge amounts on the defense budget; Obama must prove he’s tough by wasting huge amounts, too! Salary limits for CEOs? Don’t hold your breath. You’d think I would be happy about the executive-pay limits Barack Obama announced Wednesday. The announcement got fantastic press for Obama — our new president is the most gifted media manipulator since Ronald Reagan, and successful modern presidents have had media-manipulation skills. But the “limits” are not what they seem. For most firms that receive federal bailout money, the “limits” are voluntary. Golly gee whillikers, CEOs will voluntarily limit their own pay, won’t they? Corporate executives don’t need a presidential directive to place voluntary limits on their bonuses, they can do that on their own at any point. The “limits” apply only to firms that receive what the Treasury Department calls “exceptional aid,” meaning most of the millions and billions being handed out as gifts to banks around the country will continue to come with no strings attached. So far, three firms have received aid classified as “exceptional” — AIG, Bank of America and Citigroup. Guess what? AIG, Bank of America and Citigroup have been exempted from the limits. The “limits” announced by Obama would bind any firms that may receive “exceptional” aid in the future, but for now, bind no one.